Thanks to Better Homes and Gardens at Walmart for sponsoring this post. The favorable opinions of super cute and helpful organization items are 100% my own. I wish I had a dedicated laundry room. A big huge space that would fit several baskets, maybe it would have some cabinetry to hide all of the junk I can’t seem to let go. 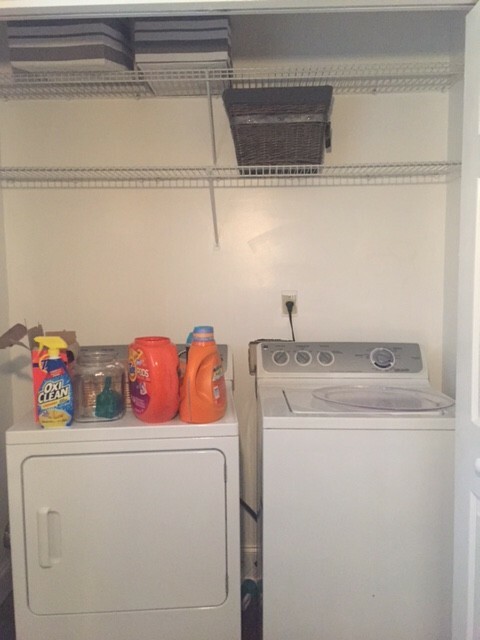 No big huge laundry room here, actually my laundry space could be defined as a laundry closet. It’s a small space off of the dining area hidden by two bi-folds. 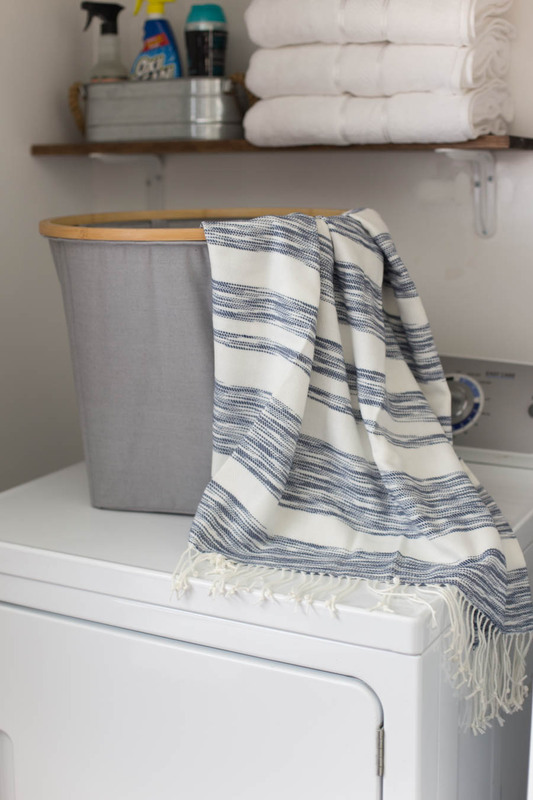 I’m learning to appreciate a small laundry space because it does two things for me: #1 Laundry doesn’t pile up because it has nowhere to stay and #2 Junk doesn’t pile up because it has nowhere to be stored. That being said, until recently, I still despised this laundry area but it just wasn’t very pretty. The wire shelving came with the house and it was filling up with random stuff. Since there’s no cabinetry you can see all of the things and the mess was giving me anxiety. 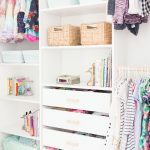 When Better Homes and Gardens challenged me to decorate a small space this month using Better Homes and Gardens products from Walmart, I knew immediately I would finally get the organized laundry closet I’d been needing! There is a trickiness to having such a small laundry space. Since space is limited you have to be strategic about storage. Utilizing all of the wall space was key in organizing my laundry closet. As I mentioned, we already had the wire shelving so I kept it even though it wouldn’t be my first choice. It was already installed and hello, free. I added galvanized bins and the striped storage cubes to corral all of the odds and ends that were previously on the shelves open to sight. That immediately changed the look of the space and made it way more organized. You can see what a mess my laundry space was before. And so dark and dreary looking too! Previously, I kept all of my laundry soap on top of the dryer making it feel really cluttered. I had Matt put up these wood shelves just in reach from the washer and dryer to store all of my laundry supplies. 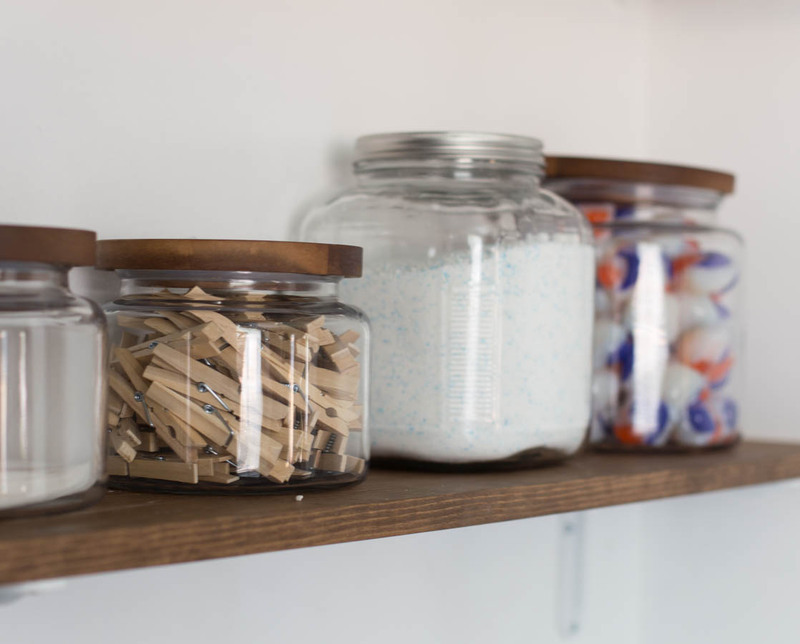 Since everything looks better in a glass jar, I filled these acacia top glass jars with my favorite laundry supplies. 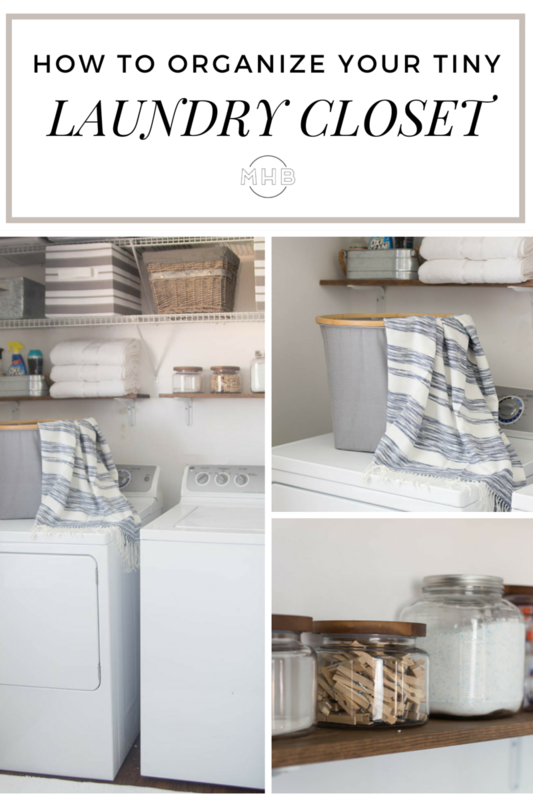 On the other shelf, I store more laundry supplies corraled in a galvanized utensil holder (similar to this one) and some soft fluffy towels from the Better Homes and Gardens line at Walmart. I also bought this gray fabric laundry bin to replace my plastic one that is literally falling apart. I love the fabric and wood rim – I think it will hold up way better over time. 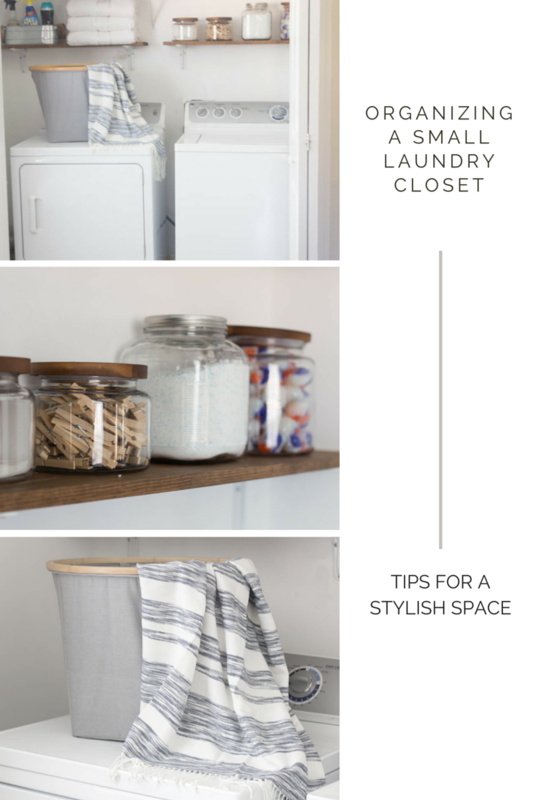 Organizing a laundry closet can feel challenging at first but the best tip I can share is to utilize all of your space and think outside of the box. 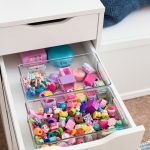 Going vertical obviously makes the world of difference here, in addition to using decorative storage pieces that allow you to keep all of your things together but out of sight. 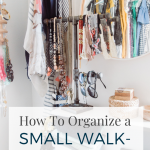 Tell me, what are your small space struggles? 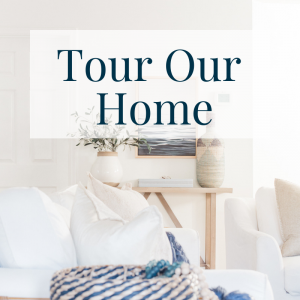 Do you have a spot in your home that is short on space and style? Or maybe you have even more solutions to share? I’d love to hear about them in the comments! Oh my dear it looks darling! 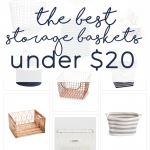 Love all the cute but super-functional storage. 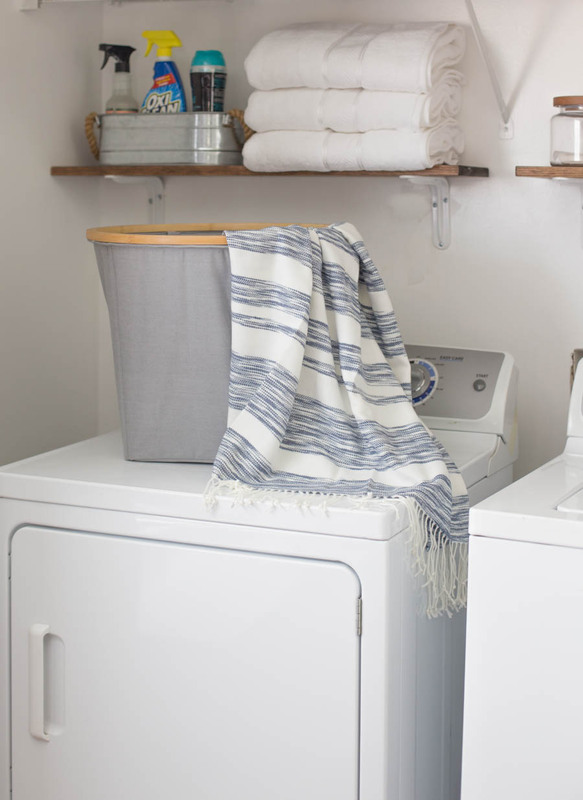 Those wood top canisters are super adorable in your laundry space. Looks so cute, Chels! 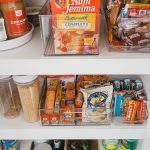 Your new shelves are perfect for your small space! Love the accessories! I just upcycled my bathroom and now the laundry room is next. So Thanks for the tips! Happy to be an inspiration! Hope you had a great weekend, Dolores! I’m in the process of redoing My laundry closet…yes it’s a closet too. Instead of using shelves I used wine crates ! But I also used walmart garden dispensers to put my detergent, I used the middle crate and did a little display, with a vintage wash board and a vintage Clorox bottle. Wish I could send you photos,but don’t know how. 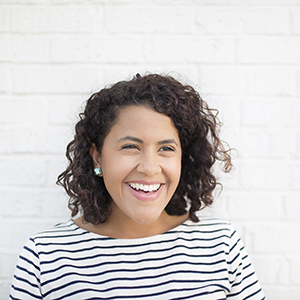 Loving your blog from Puerto Rico. My current biggest complaint about the current laundry area is that it’s my kitchen. The apartment that my Mom and I are currently living in no longer has a washer/dryer hookup, and so we have a portable washer that we hook up to the kitchen sink. It also doesn’t help matters that it’s right inside the back door, and the storage spot for it has no doors. But your laundry closet looks amazing, and I totally agree that Walmart has definitely been stepping up their home decor game. 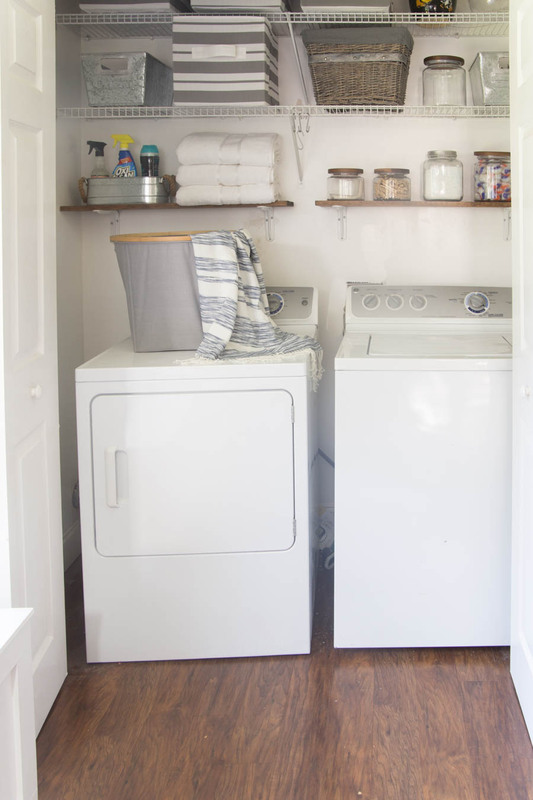 You laundry space looks great! 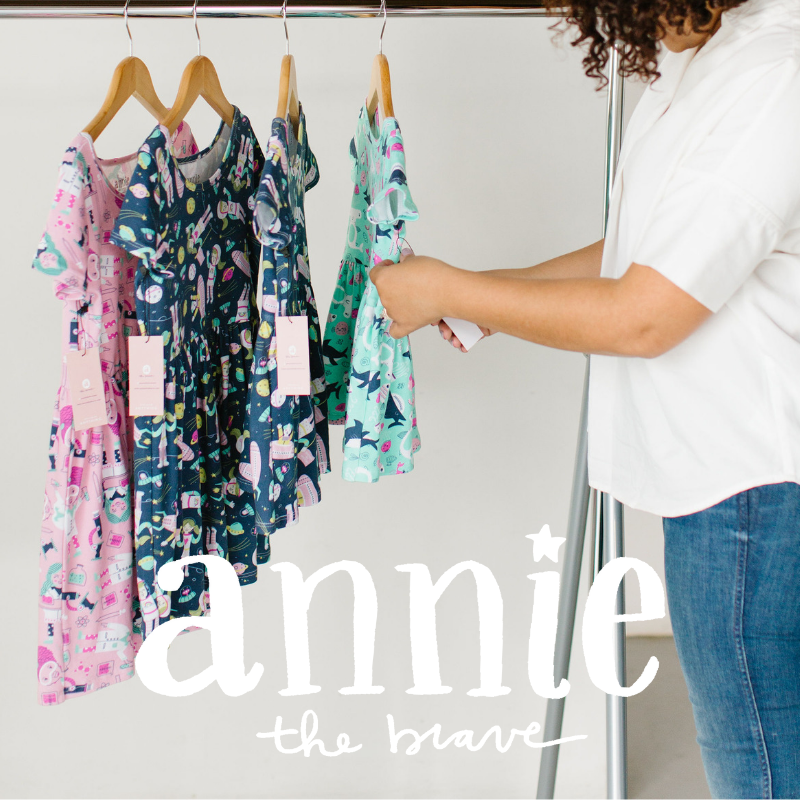 It feels good to be organized…I need to work on that!